Help River Bend Nature Center by donating much needed items for our educational programs and daily operations. We make it easy for you to make a difference. Give us a call for more information: 262-639-1515 or contact us at info@RiverBendNatureCenterRacine.org. Your donation will support environmental education and outdoor recreation. Thank you for supporting our mission and be sure to come out and play! 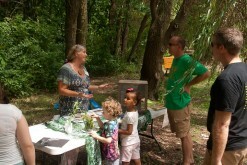 River Bend Nature Center, Inc. is a 501(c)(3). Your donations are tax deductible.